Rich Oreo crumble crust topped with a decadent and luxurious cheesecake middle and drizzles of caramel, melted chocolate, and of course coconut on top. 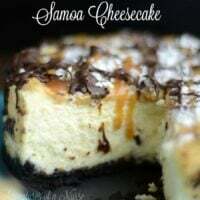 This Instant Pot Samoa Cheesecake made with Ricotta cheese is probably the best cheesecake I have ever made. I know that is a bold statement, but honestly, it is one flavorful, creamy, and mighty delicious cheesecake that takes the cake for all other cheesecakes I have made! 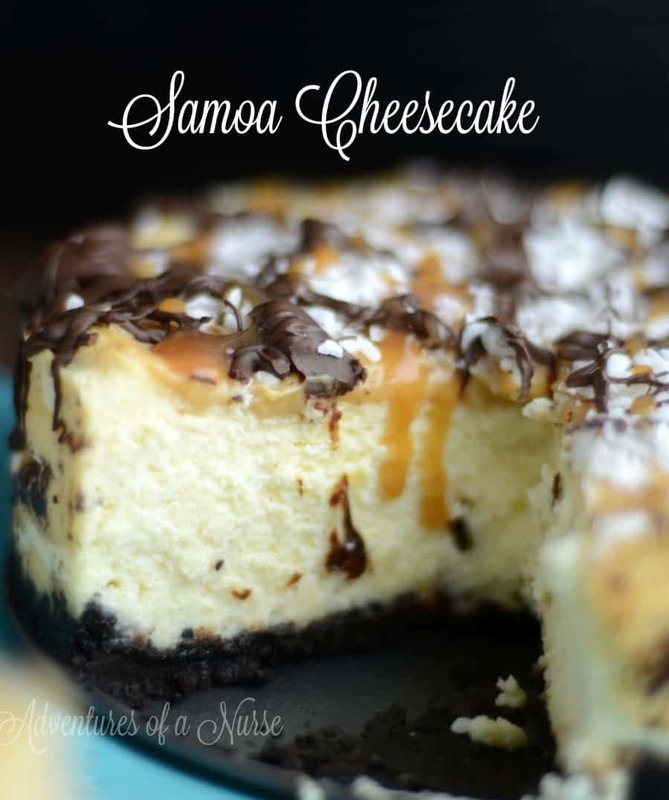 You get the rich flavors from a Samoa Girl Scout cookie but in the form of a creamy and smooth cheesecake that is topped with Samoa ingredients. Have you noticed that depending on where you live in the world, you might better know the Girl Scout cookie by another name? I learned this a while back when I was talking about the love of Samoa cookies, and I was asked, “What is that?” At first, I thought they had never had the glorious goodness, but when I explained the cookie, they called it a Caramel Delight. Same goes for Tagalongs and Peanut Butter Patties, and Shortbread and Trefoils. 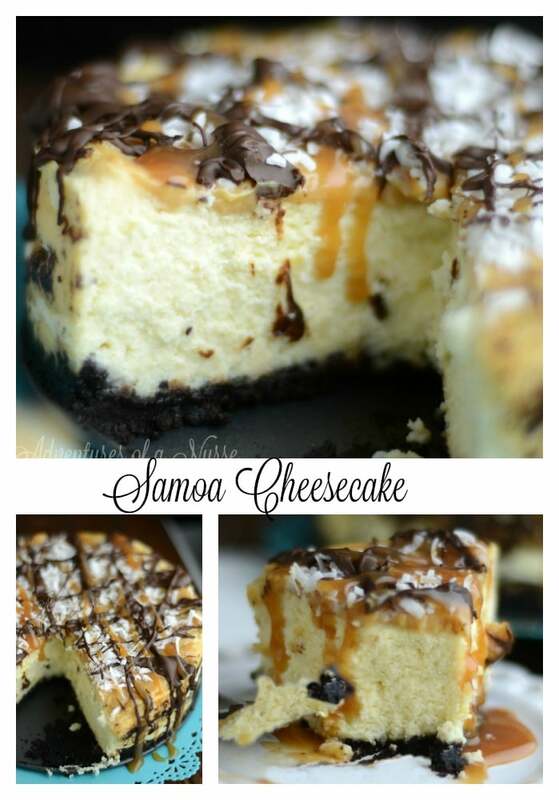 So you might call this cake a Caramel Delights Cheesecake or Samoa depending on where you live. Either way, if you like the Girl Scout cookie, and cheesecake, this is a lethal combination that will bring you to your knees, thanking me for this glorious recipe! Many know that cream cheese is the base for most cheesecakes, but did you know you can also use Ricotta cheese? Ricotta cheese helps make the cheesecakes a bit more fluffy in texture, less dense, and not as sweet in flavor. 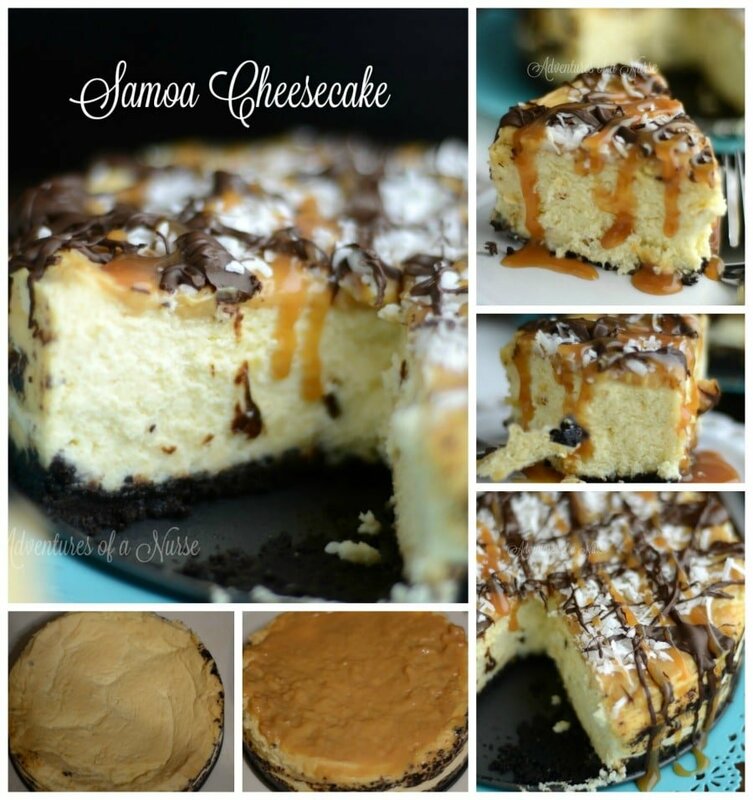 So when I add the toppings for this Samoa cheesecake made with Ricotta cheese, it is the perfect amount of sweet. It helps bring the dish to a sweet and slightly tart combination, which is what makes it so delicious. If I were to use cream cheese in this cheesecake recipe, I think it could have the potential to be overkill on the sweet factor, and it wouldn’t taste as good. The Ricotta cheese adds a new flavor to the cheesecake that sets it apart from others, and I like my food to stand out when people devour it! 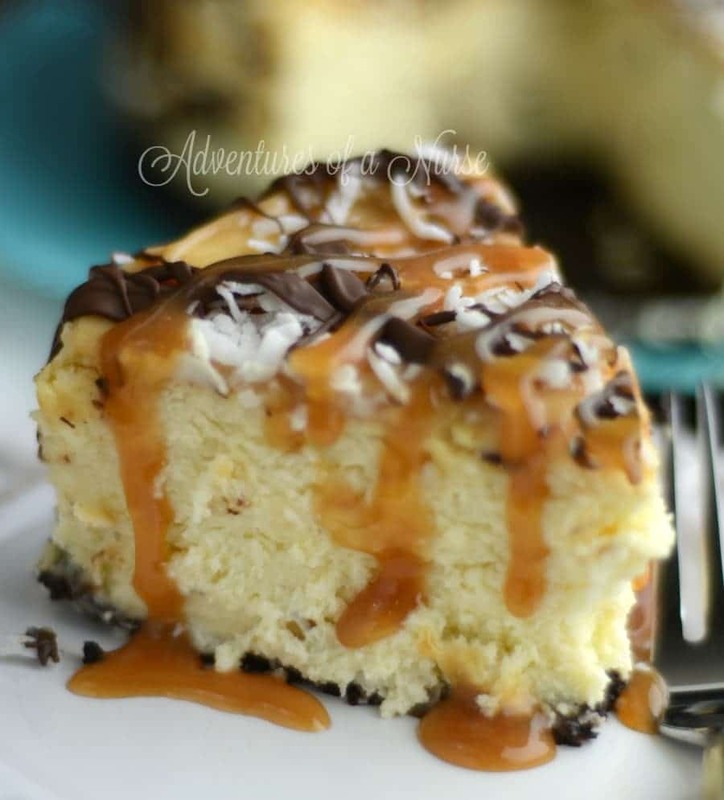 This Instant Pot Samoa Cheesecake made with Ricotta cheese is probably the best cheesecake I have ever made. Mix together cream cheese, ricotta cheese, and sugar. Add in eggs one at a time. Add in flour and cornstarch. Pour your cheesecake mixture into the pan. Place 1 cup of water in your instant pot. create a foil sling around the pan and lower into your instant pot on top of a trivet. Cook on manual high pressure for 40 minutes. Do a quick release. Remove cheesecake and place in the fridge for 2-4 hours or until completely cool. Oh my goodness-this is just what I’ve been looking for-I LOVE Ricotta cheesecake and have a recipe I’ve been using for it for years. SO happy to have the instructions to make it in the pressure cooker. Thanks so much! Found you on Melt In Your Mouth Monday-boy am I glad I did! Could you clarify where in the recipe to add the vanilla? How do you bake this without a quick pot?? I made this recipe today. The cheesecake turned out to be beautiful, but did you leave out a sweetener? The filling was a little on the bland side. I added extra chocolate and caramel to compensate, but you had vanilla in the ingredients, but not in the directions. I made this last night. Did you forget the sugar for the recipe? The filling tasted rather bland. Also, the vanilla was not listed in the instructions. I agree with some other posters – this definitely needs sugar – the filling is pretty much savoury, even with the vanilla. How much sugar would you suggest adding? So what about vanilla then? Why do you need 2 7″ spring forms pans? you don’t mention how you turn the can of sweetened condensed milk into a caramel topping. include email among your ways to share. can you make this in a regular oven? I followed the directions but after 40 minutes the cheesecake is super wiggly in the middle. I assume it’s not cooked. I’m putting it back into the IP. I wonder what I did wrong. Just making this cheesecake right now. It has now been in the instant pot for 67 minutes. It is still runny and not cooked at all in the middle. Any suggestions as to what I have done wrong? I have used your recipes before and love them but this one stumps me. Amazing recipe! Made this for my daughter and the only thing I did different from the recipe was I toasted the coconut. Your recipes never disappoint me or my family.